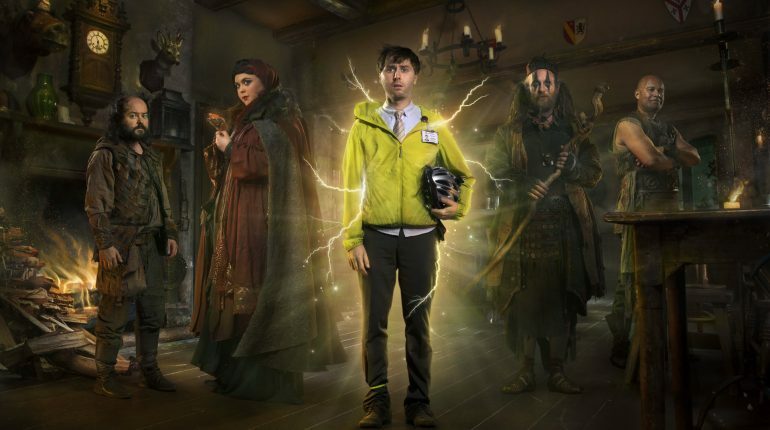 The fantasy sitcom returns for a third series, bigger and better than ever. In six brand new episodes, the regular cast of James Buckley, Paul Kaye, Sharon Rooney, Ken Collard, Louis Emerick and Sally Phillips are joined by a stellar list of guest stars including: Steve Coogan (Alan Partridge), Mark Heap (Friday Night Dinner), Tracy Ann Oberman (Toast Of London), Rufus Hound (Doctor Who), Felicity Montague (I’m Alan Partridge), Ricky Grover (Porridge), Isy Suttie (Peep Show), Rich Fulcher (The Mighty Boosh), Esther Smith (Cuckoo), Divian Ladwa (Detectorists), Josette Simon (Broadchurch), Kadiff Kirwan (Timewasters) and the legendary Sylvester McCoy. The series airs on the Dave channel from 17th October at 10pm.